Visit Our Souvenir Corner in Cuc Phuong National Park! HomeVisit Our Souvenir Corner in Cuc Phuong National Park! Our souvenir corner is a bit hidden for visitors, but it is truly a treasure trunk. There are not only witty postcards made in EPRC, propaganda T-Shirts, but also informative books about wild flora and fauna. 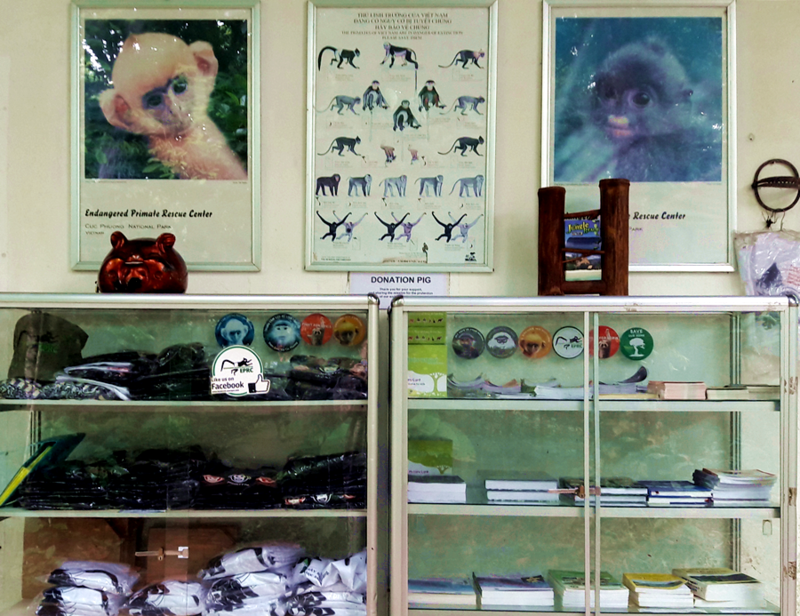 Next time you pay a visit to EPRC, please don’t forget to drop by our souvenir corner to pick your book or T-Shirt and contribute to the process of rescuing and conserving Endangered primates in Vietnam! FULL LIST OF SOUVENIRS & BOOKS CAN BE FOUND HERE. Please notice that we only see these products at EPRC in Cuc Phuong National Park, Vietnam. We may consider posting within Vietnam only because of our remote location and busy schedule. Thank you for your understanding! Oh, and our August Newsletter is OUT NOW! You can grab your online copy right now, for FREE!